Letter from C. Johnstone (probably George Johnstone's widow, Deborah Charlotte, known as Charlotte), concerning the case of her sister-in-law, Betty Johnstone. 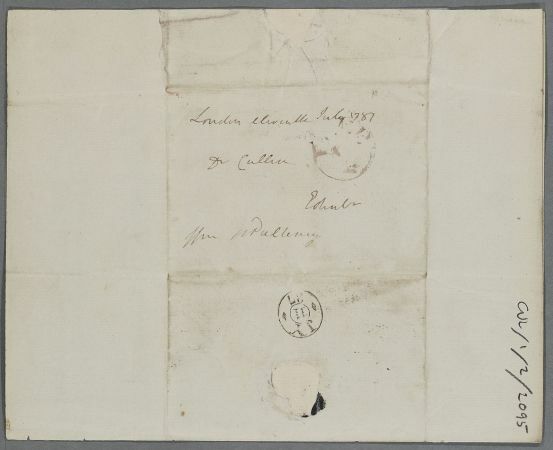 The family is concerned about her health, and the writer, who asks Cullen to reply c/o Betty's brother William (Johnstone) Pulteney at Bath House, Piccadilly, says that she hopes to visit her if "she is not in immediate danger". Summary Letter from C. Johnstone (probably George Johnstone's widow, Deborah Charlotte, known as Charlotte), concerning the case of her sister-in-law, Betty Johnstone. 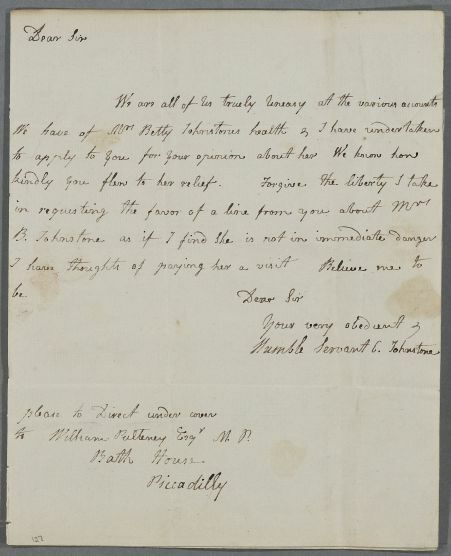 The family is concerned about her health, and the writer, who asks Cullen to reply c/o Betty's brother William (Johnstone) Pulteney at Bath House, Piccadilly, says that she hopes to visit her if "she is not in immediate danger". Case of Betty Johnstone, sister of John Johnstone of Alva, who has a serious bowel disorder which prompts Cullen to make a personal visit. to William Pulteney Esqr M. P.